Tower fans are a great tool to keep yourself and your living space cool during the summer months, and every other season. Usually, they are lightweight, aesthetically pleasing, and can purify and circulate the air in the room efficiently. However, it is possible to get your hands on a tower fan that doesn’t provide the comfort you expect it to, that is why we’ve reviewed five top-sellers to see which the best tower fan is. Many people are looking for energy-efficient, affordable, and quiet ways to ensure their home remains cool in the summer, and tower fans do just that. Lakso is known as a top-selling brand for tower fans, and the Lakso Wind Curve Fan maintains their good reputation. Let’s find out why. The Lakso Wind Curve proved to be exceedingly suitable for moving the air in smaller rooms, though didn’t appear to have enough power to have the same result in larger spaces. It’s aesthetically pleasing, lightweight, and easy to move around. The tower fan does oscillate up to 90 degrees to ensure full air circulation in the entire room, and the included ionizer reduces airborne particles such as dust and pollen. Additionally, the Lakso Wind Curve has three-speed settings and a timer that you can set from 30 minutes to seven hours. Unfortunately, we found that cleaning this tower fan wasn’t as easy since we needed to take the fan apart to clean the blades properly. However, the fan was constructed out of a durable and sleek plastic that makes cleaning the outside reasonably simple. The included remote control has a slot near the rear of the fan, so you don’t lose it, but we noticed that the buttons on the remote were stiff. This is another highly rated brand that needed to be incorporated into the list. The HYFO23W has many features that make it a viable option for a tower fan to include in your home, but do those features make it the best tower fan? When using the HYFO23W, one of the first things we noticed is how very quiet it is, which is a significant benefit when letting it run while you sleep. The fan is wallet-friendly, and the LED is easy on the eyes while the electric controls are easy to use. We also found the shut-off timer to be useful and it worked in two-hour increments, though there was a distracting beep indicating that the cycle was finished. The three different speed and oscillation settings ensured that the air circulated throughout the entire room, all while remaining cool. Additionally, assembling the Comfort Control Tower Fan was effortless, and the plastic was durable. However, the classic white color did appear to gather dust and make it look dirty quickly. 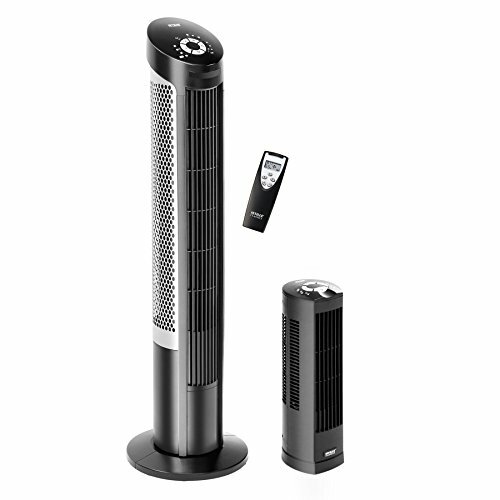 With the popularity of Honeywell, it’s no surprise that two of their tower fans made it onto the list. Different from the Comfort Control, this Honeywell tower fan offers a wide variety of features that we were eager to test out during our comparison process. Does this second Honeywell fan deserve its place on our list? We’ll see. Many people wouldn’t believe that so many features would be offered with a tower fan that has a reasonable price, but Honeywell does. The Quietset fan has an incredible eight settings that include options such as sleep, power cool, relax, calm, white noise, and whisper. The only downfall to having so many settings is that some could mean the same thing, and you do need to go through each one to find the perfect one. 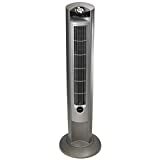 As with other Honeywell fans, the Quietset Tower Fan proved to be extremely quiet, regardless of the setting. Despite that, it isn’t as powerful as some others. We found that airflow was fair up to ten feet and that it worked well in an average sized room, but not in a large one. This fan also features a control panel that can be dimmed during the night. Additionally, it has a one-year warranty that ensures you get your money’s worth. The brand name PELONIS might not be as well-known as some of the others on this list, but it’s taking up the fourth spot anyway. 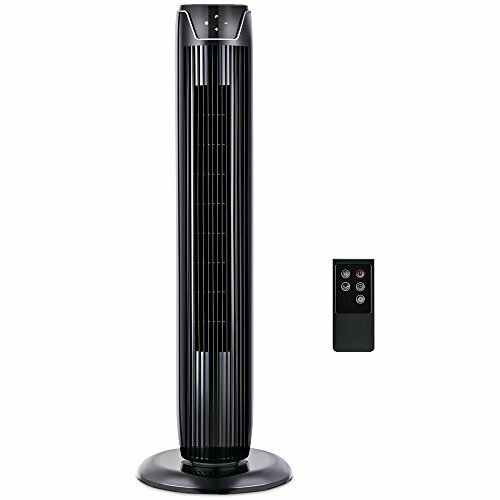 The basic, user-friendly features of this tower fan are just one of the reasons it made it to this list. Let’s find out the others. As far as functionality goes, the PELONIS Oscillating Tower Fan does what it’s supposed to do. It has three different speed settings and does push out and circulate cold air throughout the room. Depending on the configuration that it’s put on, the tower fan is distractingly noisy, and we found it could cause issues while you’re sleeping. While this fan is easy to assemble, it’s not difficult to notice that it isn’t as durable as some others and the plastic material is quite flimsy. Nonetheless, the environmental mode to help with saving power along with the screen that automatically shuts off after 30 seconds is a nice feature. 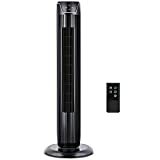 Additionally, it includes a seven-hour programmable tower and a remote control that makes it easy to control the fan from a distance. Seville has developed quite a name for itself and has been on the top of plenty of people’s favorites list because of its durability and features. We wanted to take a thorough look so that we could ensure that the Seville UltraSlimline Tower Fan is as good as so many others suggest. The UltraSlimline is user-friendly, as tower fans need to be. The included remote control works great and has five buttons that allowed us to control every function of the fan from a distance. Unlike many of the other fans that we reviewed, we were able to set the automatic timer with the remote control, which we found to be extremely convenient. What was surprising to us is that the remote offers timer settings up to 7.5 hours, while the unit itself only goes up to four hours. Also, there is a storage handle on the tower fan to ensure it isn’t lost. However, the handle isn’t as sturdy as some others. With a 95-degree oscillation range, the UltraSlimline provides excellent air circulation along with a steady airflow to keep you cool. When using it at the highest setting, the fan isn’t as quiet as some others, but given how powerful it is, that was to be expected, and a small price to pay. Fortunately, the Seville UltraSlimline comes in both black and white, so you can purchase the one that suits your home’s aesthetic. We did notice that it is slightly wobbly, but nothing major and it would only fall over when running into it. We took the proper amount of time to thoroughly test out these five tower fans so that we could ensure that the model we name the best tower fan was truly worth it, and we feel we did just that. 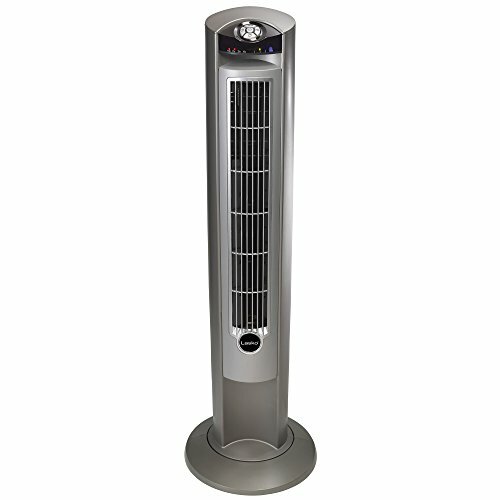 After in-depth consideration, we give the award to the Seville Classics UltraSlimline Tower Fan. Out of all the tower fans that we compared and reviewed, this one has the strongest airflow and circulates the air in the entire room. It also includes a remote control that lets you manage all other features, and it comes in more than one color, allowing you to pick the one that fits your style. The lengthy power cord gives you ample room to plug it into the wall at a distance, and the automatic timer lets you fall asleep with the fan running, knowing it shuts off on its own. 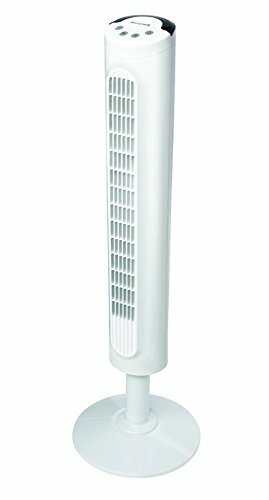 We find that the Seville UltraSlimline is wallet-friendly, so if you’re looking for a durable, long-lasting, and easy-to-use tower fan to cool your home, Seville has what you need.